Yes, yes! More goodies from Culture Shock….and…The Albero Gacha festival..thingie. Wheee! Yesterday was a weird one. I decided to tag along with my dearest friend and twin SLister, Mads, to the Gacha festival thingie and had the best time going broke with her. I’m not sure what happened after that. All I know is we ended up wandering the desert and upon reaching the cool confines of a trailer I had lost my vajayjay. I dunno where it went. But, it was gone. Not to worry, it’s back home and safe now. Poor dear. Annnnyway, I got this wonderful bag from C’est Moi! 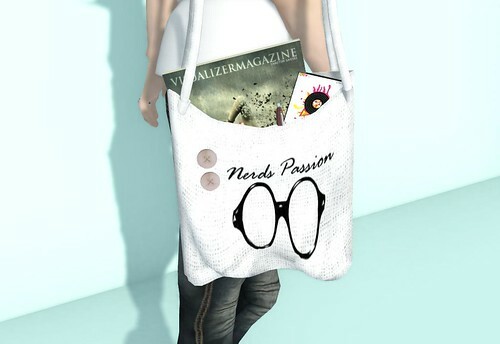 I’m not much of a bag person in SL…or RL, really. But, this one just spoke to me and I needed it. Cute, huh? More goodies from the much anticipated Culture Shock event! I was like a vulture lurking around The Secret Store booth. I just adore Maylee Oh’s creations and this Popsicle Dress is no different. It will be available at Culture Shock in a variety of patterns and the dress comes in two different styles. I decided to wear this beauty with the lovely corset I snagged at Nemesis and accessorised it with the fabulous scarf from Zeery! This skin is just to die for. I’ve long been an admirer of Pink Fuel skins and when I saw the 3 skins available at Culture Shock, I jumped. They are so beyond gorgeous! I’m popping in today with goodies from Culture Shock! This event is going to be really fabulous. Over 100 of your favorite designers with exclusive items and the proceeds going to Doctors Without Borders. You’ll be able to get some REALLY great items and support a good cause! Win, win! Twenty-four years ago today, the love of my life was born. My sweet-sweet puppy, you have changed my life. Both Second Life and Real Life. You’ve opened my heart and taught me about true love. You’re the most amazing soul I’ve ever come across and every day I’m thankful for you. I don’t want to even begin to try to imagine what the world would be like if you weren’t in it. You’re my everything and you’ve made me luckiest and happiest woman in the universe.